Tilapia is indigenous to the Nile and has been a popular feature of Egyptian cuisine since Pharaonic times when it was revered as a symbol of fertility. Despite this, high-end restaurants, hotel managers and chefs in Cairo have largely avoided serving tilapia, preferring to serve seafish or a large portion of meat or chicken instead. But with the successful expansion of tilapia aquaculture in Egypt, improved farming and fish handling practices, and the high price of alternative protein sources, chefs are starting to take more notice. Buoyed by this growing interest, WorldFish is working with wholesalers to improve quality of supply and the marketing of high-end yet affordable tilapia products, and with chefs to encourage greater use of farmed tilapia in catering and restaurant menus. These efforts are part of the SDC-funded Sustainable Transformation of Egypt’s Aquaculture Market System (STREAMS) project (2015–2018), which works to ensure the sustainability of the domestic aquaculture sector in Egypt. The project is led by WorldFish and implemented by CARE International Egypt and the Ministry of Agriculture and Land Reclamation. And the work is showing signs of success, with chefs reporting positive feedback about the quality of farmed tilapia and expressing hope that farmed tilapia will become a key component in their restaurants’ dishes. In Egypt, Nile tilapia has a history of cultivation stretching back more than 4000 years, to the time of the pharaohs. Today, farmed tilapia remains an important food source for Egypt. It is the cheapest source of domestically-produced animal protein in the country, which is the world’s third-largest producer of tilapia. Given that 25 percent of the population is resource poor, low-cost tilapia is a popular protein source for Egyptian families who either fry or grill the fish and serve it with rice, green salad and tahini. The white-fleshed fish has a mild taste and is a good source of nutrients and omega-3 fatty acids, which are essential for brain function as well as growth and development. 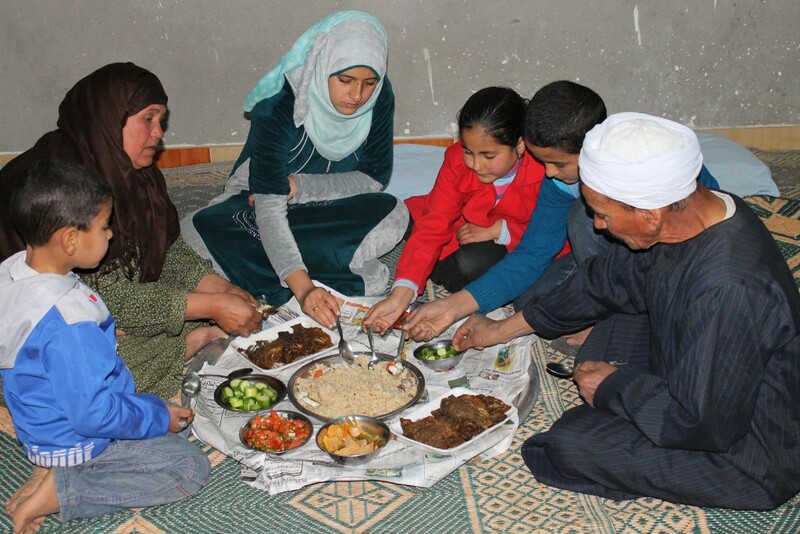 Abdallah family eating fish for lunch at Abbassa, Sharkia, Egypt. Photo by Mona El Azzazy, 2015. However, serving tilapia in restaurants depends on having reliable, trustworthy fish suppliers. Yet purchasing managers, chefs or restaurant owners often struggle to find good suppliers who provide well-harvested and properly-handled fish. “I used to serve bolti [tilapia] with saffron and couscous in my last restaurant. Despite the popularity of the plate, I had to take it off from the menu as I couldn’t guarantee the supply,” explains Wesam Masoud, owner of Bassaria fish restaurant in Cairo and a member of the Egyptian Chefs’ Association. “I had to tell my customers, “Oh, I’m sorry I don’t have it fresh today,” explains Masoud. Chef Wesam Masoud is keen to see farmed tilapia appear on more restaurant and hotel menus in Cairo. Photo by Flavor Republic, 2012. Since 2011, WorldFish has been working with suppliers to adopt more efficient and safer fish handling practices. Through activities such as public seminars, WorldFish aims to raise supplier awareness about how contamination, spoilage and physical damage reduces fish quality. Suppliers are encouraged to use ice from trusted sources to cool fish during harvest, handling, and transportation, and use refrigerated containers and cold chain facilities to allow for efficient handling that results in better quality fish. STREAMS is also partnering with the IDH Sustainable Trade Initiative to establish a certification scheme for farmed Egyptian tilapia. This will improve market standards in the live fish distribution system and ensure that regulatory authorities implement product-testing frameworks to provide definitive evidence that Egyptian farmed fish is safe. Beyond improving supply, the project has partnered with the Egyptian Chefs’ Association (ECA) to encourage greater use of farmed tilapia by chefs in catering and restaurants. Opening up these new markets that reach middle-income consumers is critical to helping Egyptian fish farmers, wholesalers and retailers cope with increasing financial pressures that come from rising feed and production costs and a low market price for farmed tilapia. In August 2016, WorldFish held a participatory workshop for 20 members of the ECA at its farm in Abbassa, Sharkia. Chefs were invited to discuss their preferences when buying seafood—helping to inform WorldFish’s understanding of consumer preferences for farmed tilapia—as well as shown new preparation methods and recipes for farmed Nile tilapia. “There is a level of inspiration that happens when the chefs see where fish come from. 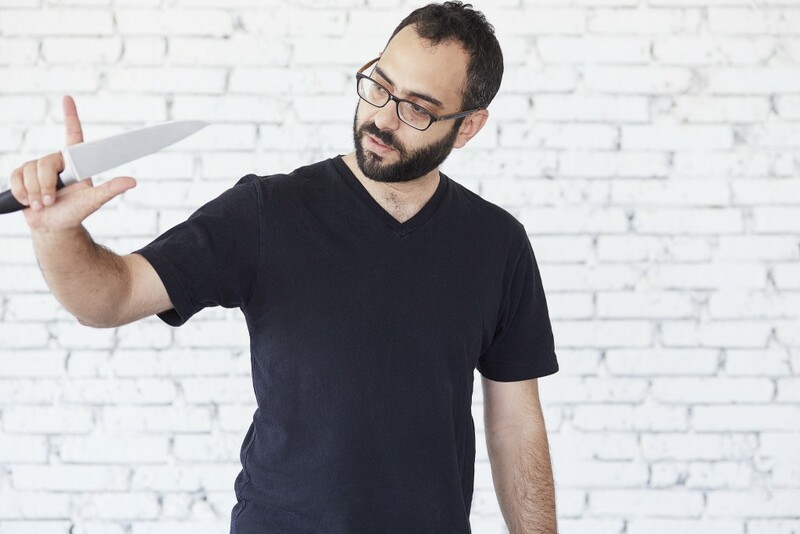 The simple fact that somebody listened to what I was saying as a primary consumer of this product, made me feel valued as a chef and I think that lots of chefs enjoyed when they visited the farm,” says Masoud. 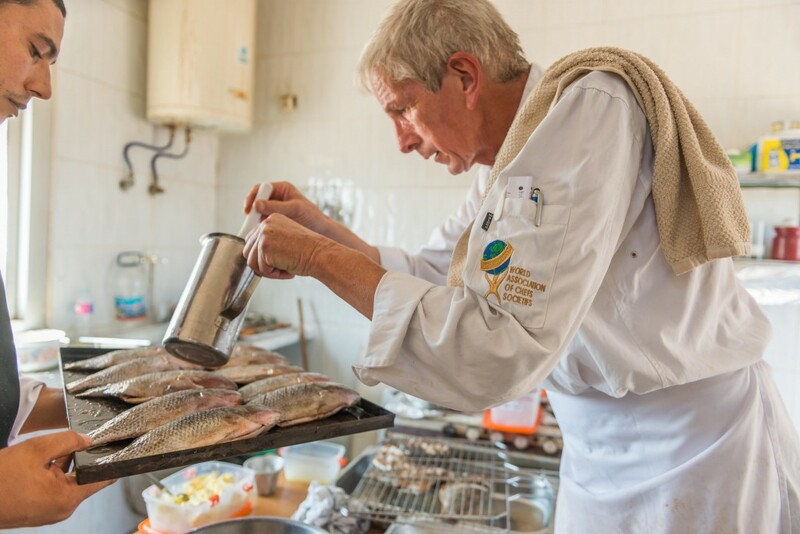 Chef Markus Iten cooking tilapia for a chef taste test, Abbassa, Sharkia, Egypt. Photo by Heba El Begawi, 2016. 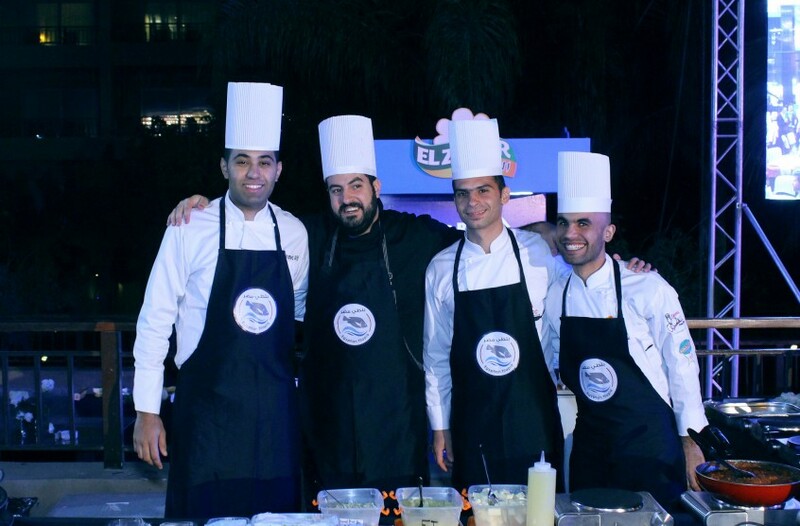 Harnessing this positive response from chefs, WorldFish provided the ECA with 100 kg of fresh Abbassa tilapia—the improved, fast-growing strain developed by WorldFish—to cook at the La Cuisine Festival held in Cairo in December 2016. This buy-in from chefs is helping to promote tilapia as a cheap, nutritious marketable source of protein. “Tilapia can be served for a wide range of purposes, at both a street-side or high-end restaurants. It can be prepared either with expensive ingredients like saffron, or simply with lemon juice,” explains Masoud. Recently, WorldFish and other stakeholders including producer organization the Aquatic Union for Fisheries Cooperatives launched an Egyptian tilapia marketing campaign to build the brand for tilapia and improve aquaculture and marketing methods. Momentum is growing among partners and commercial networks—including large-scale operators, farmer cooperatives, wholesaler syndicates and producer organizations—which will continue to develop the marketing campaigns around upcoming events. Through these efforts, WorldFish hopes to see the more widespread use of farmed tilapia in both Egyptian households and restaurants. “Nile tilapia is a very important fish in Egyptian culture. Even, in hieroglyphics, ancient Egyptians had a distinct symbol for it. If the pharaohs saw that this fish is so important that they created a symbol for it, we Egyptians should also be proud of it,” says Masoud. 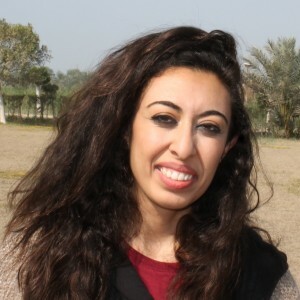 Mona El Azzazy is the Communications Officer for WorldFish in Egypt. She helps create stories about the aquaculture and fisheries sectors in Egypt and raise awareness about the importance of farmed fish to the country’s food security. Previously, she worked as a freelance writer and translator for intergovernmental and non-profit organizations. She studied languages and specialized translation at University of Paris III: Sorbonne Nouvelle and is currently partway through a Master of Public Policy and Administration.